Photographs of pollarded branches showing just the tiniest green shoots are juxtaposed with photos of trees in full leaf, here is spring and summer side by side. The translucent gampi tissue on which the photos are printed gives a breathtaking impression of fragility. 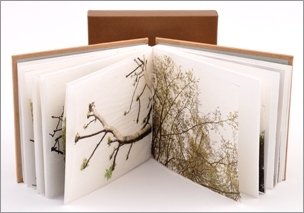 The brown binding and slipcase give an earthy feel to this small delicate work. 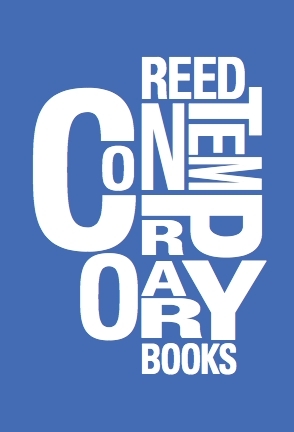 Few words, just ‘Trees’, the edition number and the artist’s name. Pauline Lamont-Fisher is a walker, an observer, a lover of landscape and of a sense of place. She studied Fine Art at Hereford before doing Book Arts first at LCC and then at Camberwell. Edition of 15, 97 x 107mm, 80 pages, 18 photographs digitally printed on to Japanese Gampi Tissue, sewn within plain Fabriana Accademia 200gsm. Bound with grey board covered in brown craft card and with a brown craft card slip case. Signed and numbered by the artist.